The CapLite utilizes interchangeable LED lamp technology allowing you to mix and match colored bulbs to create spectacular effects inside the BioBubble. 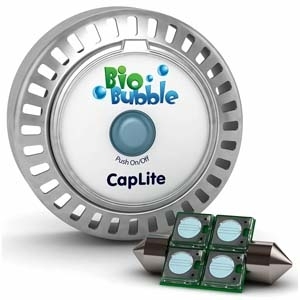 The CapLite is compatible with all BioBubbles and WonderBubbles and interchanges with any color BioBubble cap. Available in black, silver, blue, purple, green and pink.